"Wasn't that a great day? That was an awesome day -- what a great night, too. Don't you guys think that was a great night? And, man, isn't this a great town that Uncle Matt and Aunt Bean live in? Look -- they have a bank and a car store and pizza places and there a Walgreens...and a church. Everything is, like, right here -- you could walk to anything you wanted in, like, five minutes...and..."
And on he went, spurred on by me. I was having a blast pointing out even more things to him: "And look -- a place for Chinese food. And there is a liquor store in case you ever want to get drunk (laughs from the kids -- sidelong glance from the wife)... and a doughnut shop and..."
...and the kids got more and more rev'ed up about the neighborhood as we went, ridint the Hawiian wave of post-holiday joy. Anyway, I wondered about this extreme good mood -- what had made it such a good night and day for my boy? A writer named Gretchen Rubin, author of a book called The Happiness Project -- a book that I haven't read but that my wife has told me a lot about -- maintains that in order to achieve happiness, we should do many things, once of which being: Remember what made us happy as children. Those things probably still apply, if in an altered or slightly updated form. I buy that. So, I'm always on the lookout for the wisdom my kids -- my little teachers; the fathers of the man, if you will. If I tally up the day, I see many of the usual things that TV self-help gurus are always floating out to us in their prescriptions for contentment (which are available, in full, for just $19.95), along with other contributing factors: 1) Friends, family, etc. But they get that a lot, so I can't credit the extremely high evaluation of the day to that. 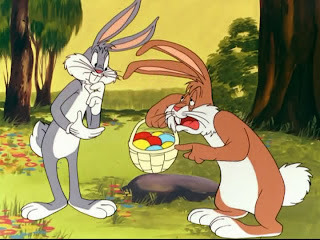 2) Easter -- it was a holiday. Yeah. The moods usually improve on holidays, but a holiday has never, yet, inspired an intellectualized and verbalized rave-review of the day like this one did. 3) I realize that the sugar-level in the systems was higher than is advisable, but this hyper-sugaring on Halloween, too, without this kind of result. 4) No school for a week. Yep, that helps. But four years for school holidays never inspired this kind of a conscious evaluation of the day. Where I think this all came from was the day's perfect story arc and the number of things that contributed to the happiness of my son, as an individual -- things he doesn't yet recognize as contributors to his happiness. Soon, the boys emerged, triumphant, with their sketches in hand. My little guy (eight) had come up with what, I must say. is his finest Sponge Bob Squarepants likeness, yet. My older son, Captain Enthusiasm, had created his pencil masterpiece: "Timmy the Sheep" -- a Nick Park character that the boys love. And there it was: the thing that elevated this great day above all previous great days. Creation -- but more, a creation that came at the end of a perfect day's story-arc; the conclusion to hours of blissful business. The boy had found (as he has on other occasions that were not holidays), the joy of creativity. He had produced his best artistic work yet. Under the tutelage of his illustrator uncle, he had created a picture that imitated form but that expressed a feeling of cuteness, as well. at the end of the day, he was proud of himself. Time well spent + a real achievement = pleasant dreams, if you ask me. My job as a dad? Well, I can't make this happen -- I can't make days fall into perfect order; I can't fill activities with intrinsic satisfaction for my boys. But I can remind them of what they already know but are apt to forget as often as I do -- of what they, as little teachers, remind me on a regular basis: When things are either good or bad (with kinds of hearts our family has been given) the companion of creativity is always there to lift us one notch higher. Creativity is the brush that colors the daily greys or that adds sparkle to the edges of the brightest sunbeams. That's us. What's you and your kids? As much as I'd would love to, I cant take credit for any tutelge. Grandmom brought them up there, and they sat down wanted to draw.I just gave them the materials. The drawings, and the joy of creativity was all theirs. Often artists (me included) get asked "Why do you draw?" The best answer I've heard (I'm kicking myself for not remember who to credit for it) was "Why did you stop?". I don't think the answer the essence of that answer applies to something more than just visual art. So funny! I love our neighborhood too. :) I know every day I get to create is a better day and I'm always mad at myself when it doesn't happen. I love how they refer to the studio as "the art room." Maybe the studio itself inspired them. Seeing all the art work and "tools" around is sure to make one feel like drawing. Uncle Matt and Aunt Bean: Matt, I love that quote. All artists, of every kind, have really managed to hold on to things that kids find instinctual. I was sure you'd helped him, Matt -- he really managed to get some shape into his drawing for the first time. Cool. Gina, the studio certainly did inspire them -- how could it not? If a studio is set up right, it is a guaranteed effect...mine does the same for me (and them); it is always fun to see them sitting in my studio and "jamming" on the guitars or the piano.